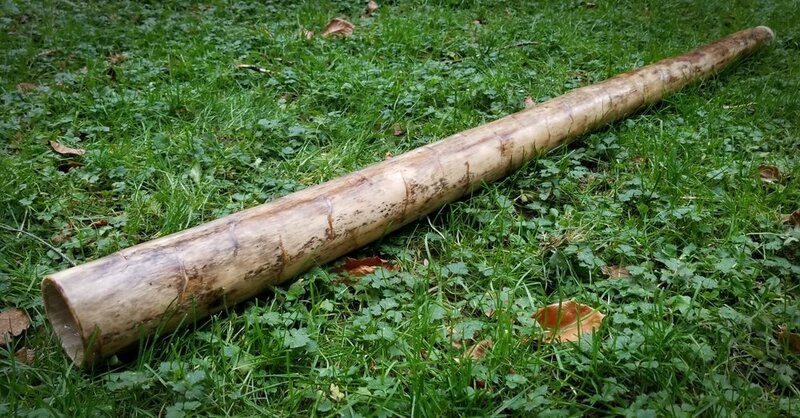 This is a journey of a didgeridoo in the making in photos and comments. 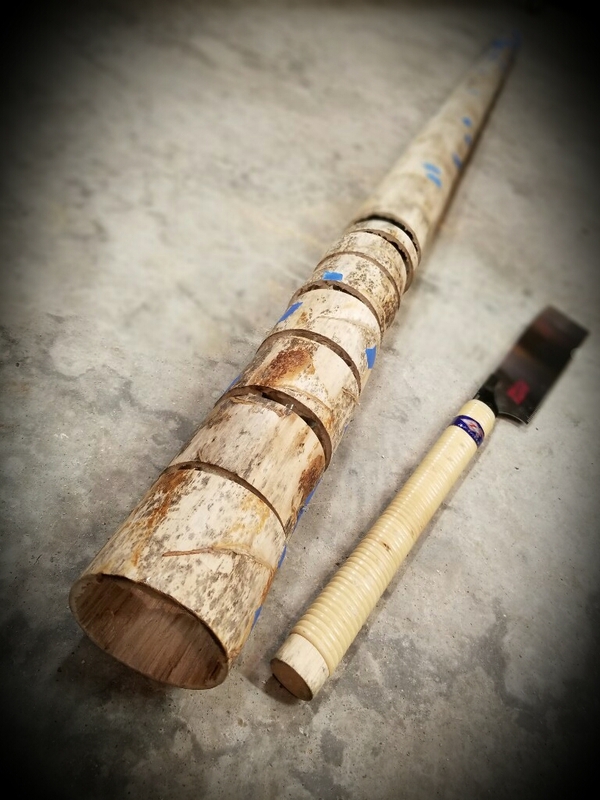 I’ve been wanting to do this project for awhile now, telling the story of how a didgeridoo is made so now here it is. As I work on it I will continue to add photos and commentaries until the didgeridoo is done. At the end, I plan on making a sample video of what the didge will sound like. 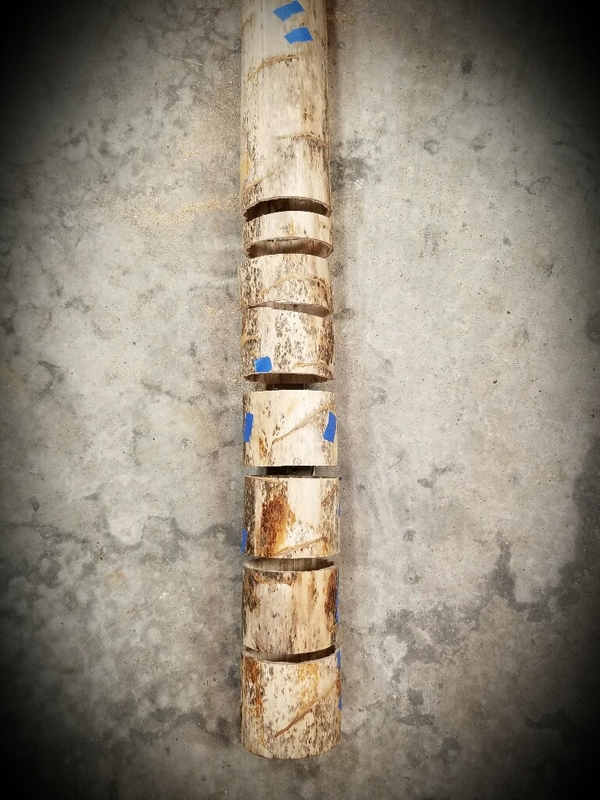 The didge is one I’m making for a couple in Kansas. 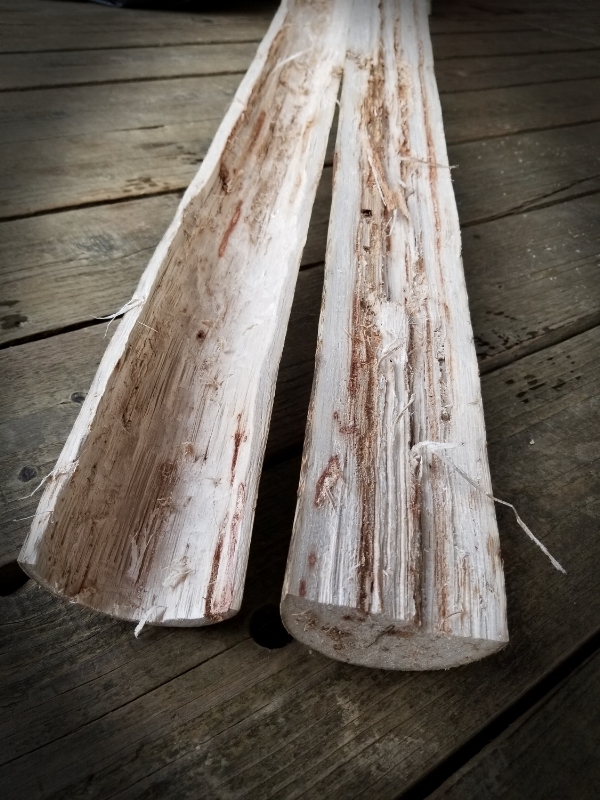 The wood I’m using is a yucca stalk, which is the flowering part of the yucca plant. 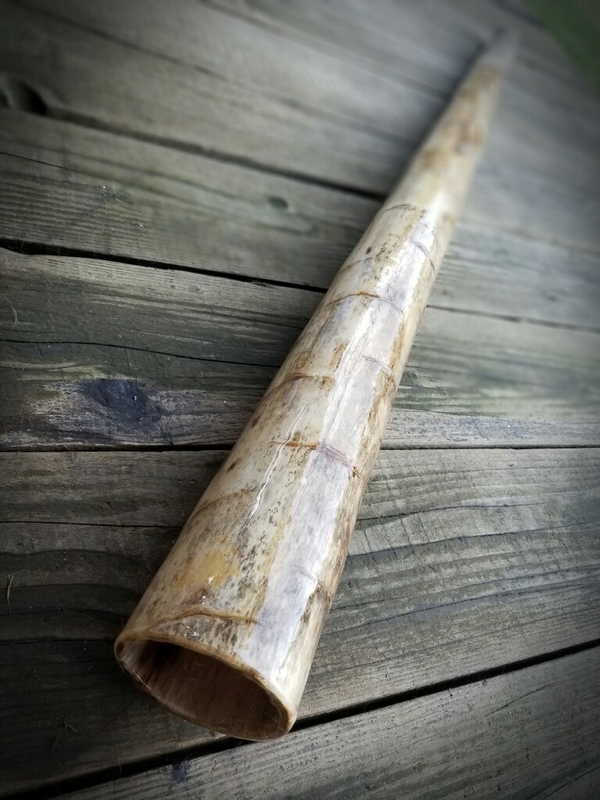 The main reason I wanted to do this project is because many people ask me “how is a didgeridoo made?” This journal, I hope, can be an answer to that question. Many thanks for coming along on this journey. Let’s begin….. 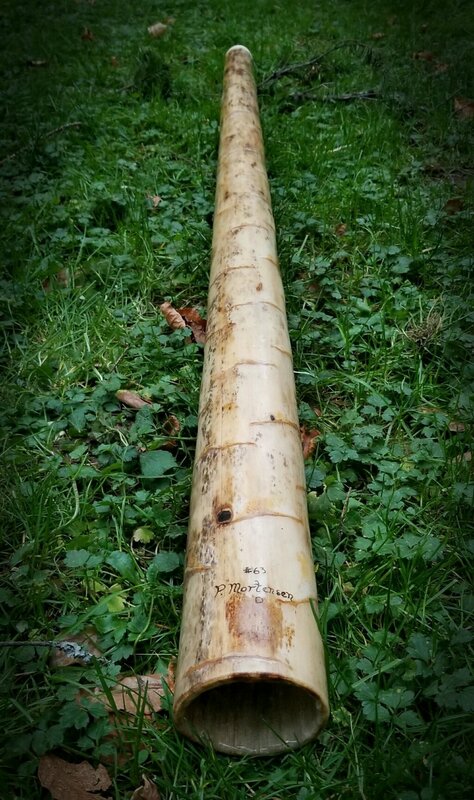 The stalk started off as a eight footer but since I need to make a D didgeridoo, I had to cut it down to around six feet to start with. This photo was taken just before I split it with the box cutter and the one butter knife you see in the photo. I usually use two butter knives but they were in storage somewhere. It didn’t take long to split it since the shell is fairly thin, which makes the making process a bit of a challenge - to hollow it out without breaking or compromising the shell. Splitting is done now. The one butter knife worked! It’s pretty bug eaten at the top end but has a fairly solid bell end. I think this is gonna be a good one with lots of resonance! And I’m done for the day. Got most of the material from one side out using my trusty 20mm gouge. The material in yucca is super soft - like a stringy, spongy material which makes it fairly easy to get out. 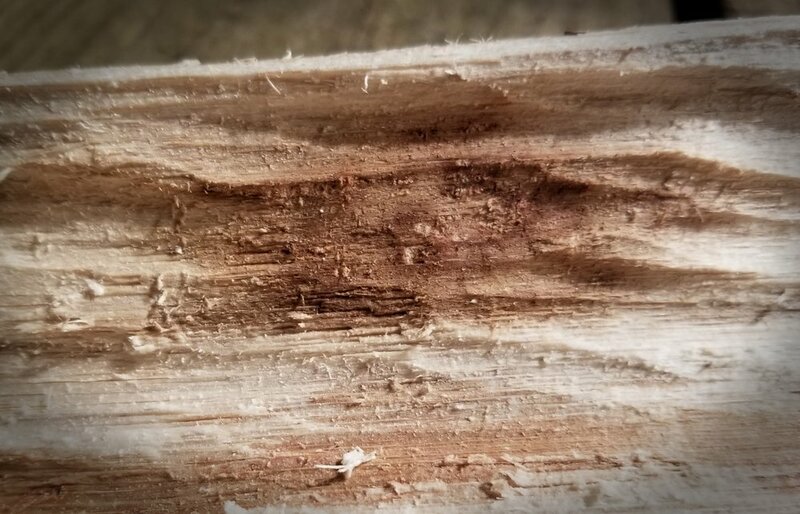 Occasionally, I come across actual hard wood spots on the inside. This didge has a couple of these. Next step is to start the finish work with a smaller (about a quarter inch) gouge. As you see, I do pretty much everything by hand. I like doing it this way mostly because it’s my meditation while creating. 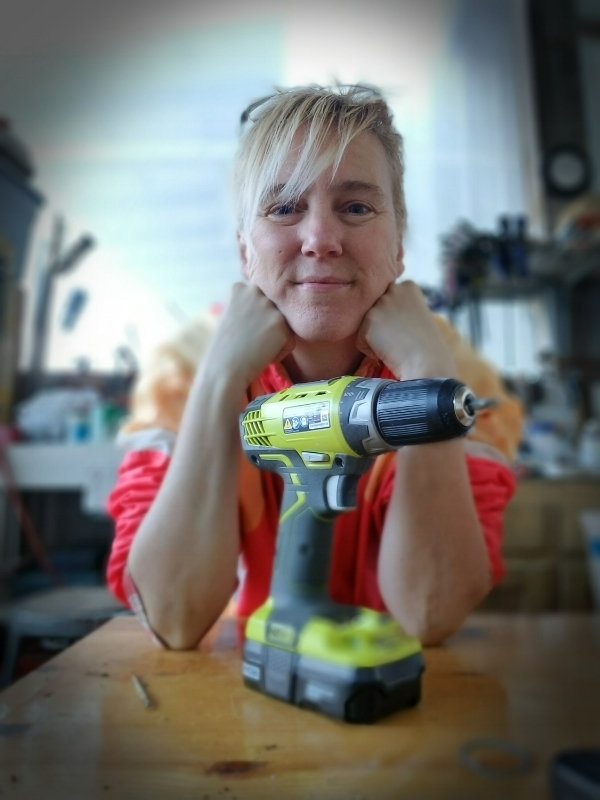 I get to really know the didge inside and out so by the time it’s shipped, it’s not just another instrument but rather a creation going out into the world to make more happy people. The bug eaten bit of the second side. 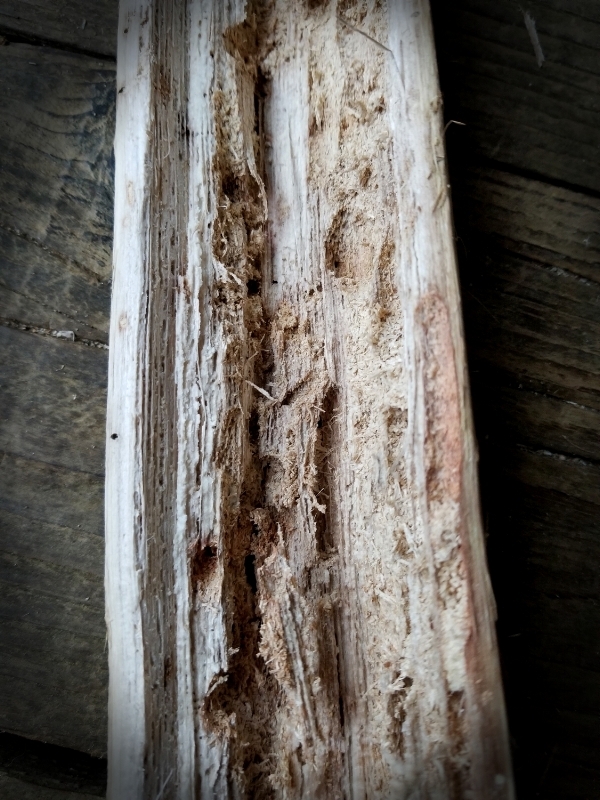 A lot of the top end of this didge was chewed up by a beetle. I know this for a fact because I found the body inside (sorry for “ew” factor). There are a lot of tracks and plugs left behind which makes my job a bit easier……At least until I get to the bell end. I have three main tools I use to hollow out a didge. The two you see here are the 20mm gouge and the quarter inch gouge. The third tool isn’t pictured but it’s a linoleum cutter which looks like a nasty claw from some prehistoric critter mounted in a handle. I use it to get the bulk of material out. It does a great job as you may imagine. The 20mm gouge is used to get the remaining material out while the smaller quarter inch gouge is used to do the detail work on the inside. And day 2 is done. I finished after dark but the didge is well on it’s way. I hadn’t planned on it but I got the second side mostly hollowed out. The red bit in the photo on the right is one of the hardwood spots I mentioned earlier. It’s not super hard but it is wood - about the hardness of bass wood so it’s easy to carve. The next step is to do the detail work on the second half. See ya’ll tomorrow. So I had a fatality today. I was doing some of the detail carving on the inside when I heard a snap. 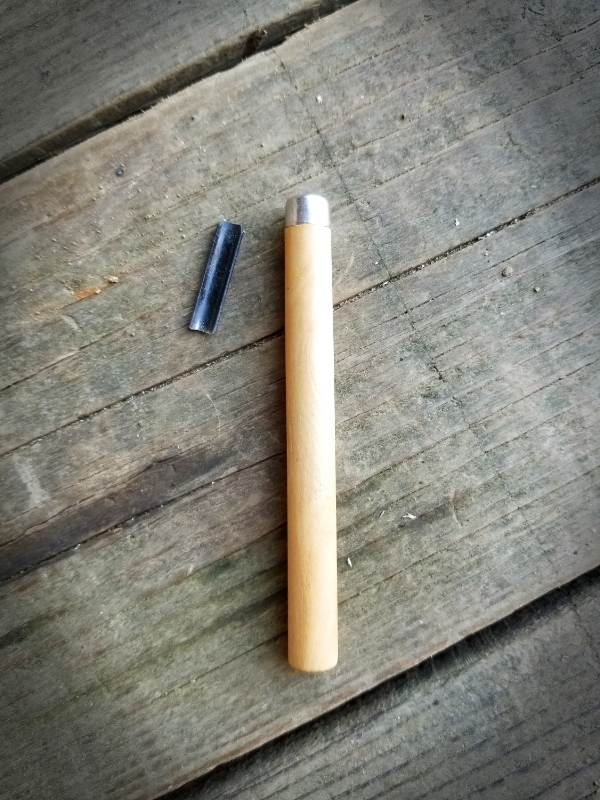 My quarter inch gouge is now in two pieces. I ended up finishing the detail work on the inside with a smaller gouge. It took a bit longer but the inside is done. You can’t really tell the work I’ve done from the photos but at least you know what the inside of a yucca didge looks like now. Get the hose clamps on and tightened before the glue decides to dry. 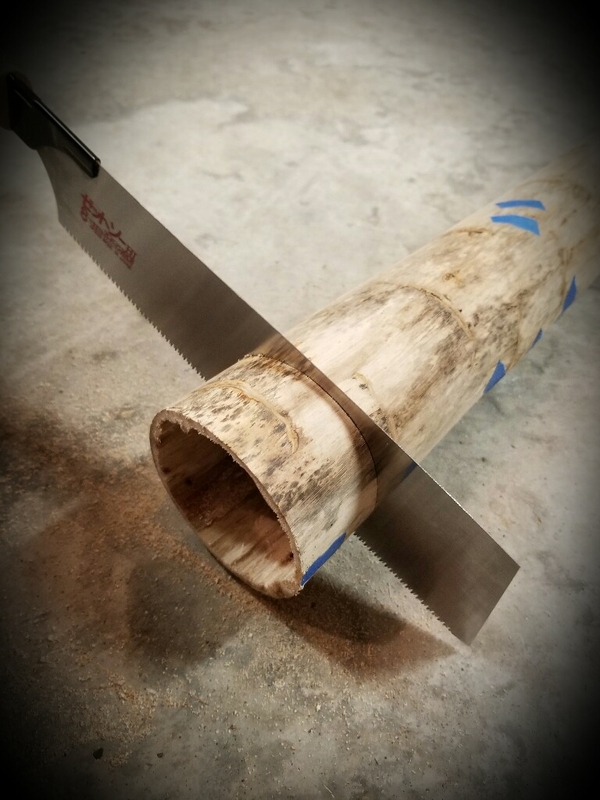 Working with yucca and agave can be a special challenge because sometimes the shells are super soft and thin as is the case with this didge. But in tightening the clamps, I didn’t hear an cracking noises so it’s all good. Took the hose clamps off today and started the making the mouthpiece. The wood I’m using is poplar. It’s not the prettiest wood nor the hardest but it is a nice wood with a good consistency. Below are photos of the steps I take in cutting out the “doughnut” and gluing it on to the didge. It’s definitely not the quickest or most efficient way to do things but it still works in getting a nice comfy mouthpiece. 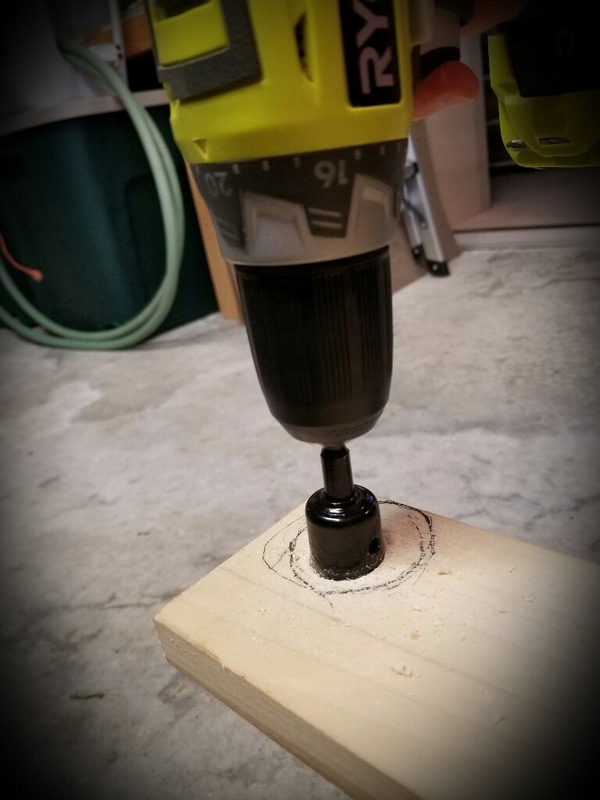 After cutting out the mouthpiece, I sand the inside diameter to the size I want which is usually around an inch and an eighth give or take a 16th of an inch. 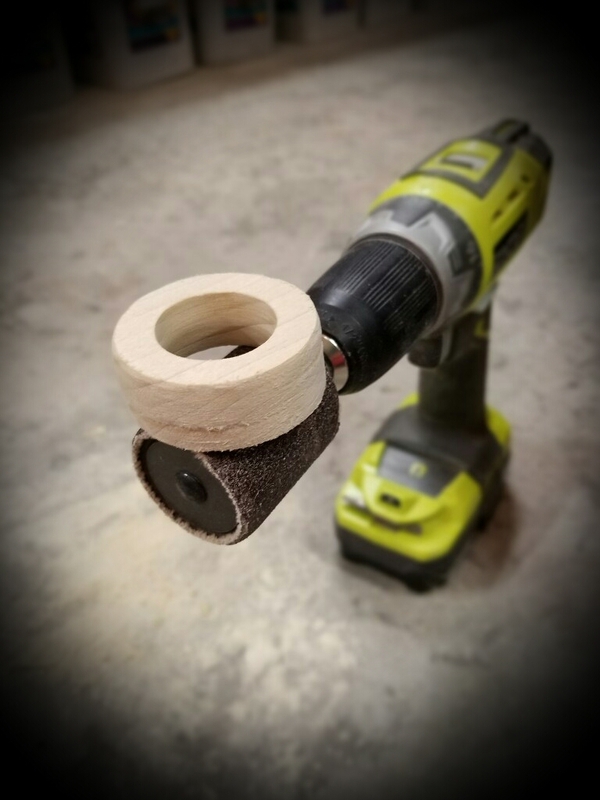 After the sanding, I’ll glue the mouthpiece doughnut onto the didge and secure it with electrical tape to hold it on tight. Seems like an odd thing to do but it works every time. 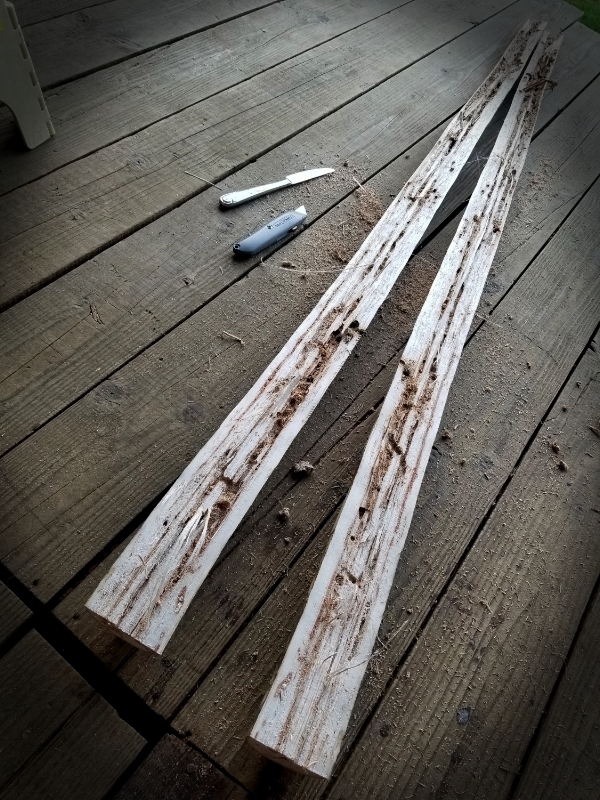 Next up, sanding……lots of it. And taping the bug holes with painter’s tape so when I pour the epoxy through the inside, it stays inside. I call this step blue measles. Today is the first coating of epoxy on the inside. After mixing the epoxy, I poured it down the mouthpiece end so I can get a nice even coating and better coverage around the mouthpiece joint where it’s most critical. After the pour, I capped the ends with plastic bags to keep the epoxy in. At about four hours, I take the bags off and let the didge bask next to a warm heater to expedite the curing. Tuning day. 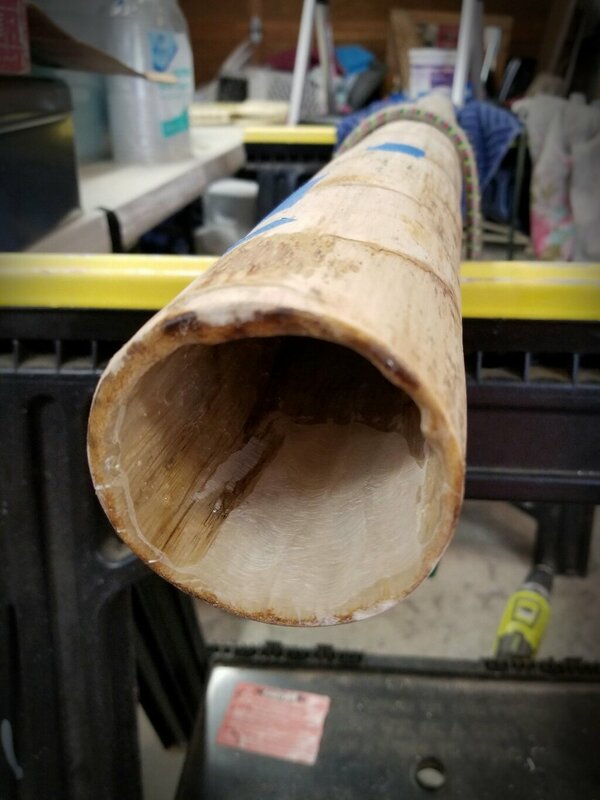 So when this didge started out, the original stock was about seven and a half feet long. I had already cut about 18” off the bottom which sacrificed a beautiful large bell and took the stalk down to about six feet. The piece I cut off with the big bell will be used later for another didge. Since the stalk is so skinny, I knew I was going to have a fairly low note. It turned out to be a low Bb and I needed to make a D didge. 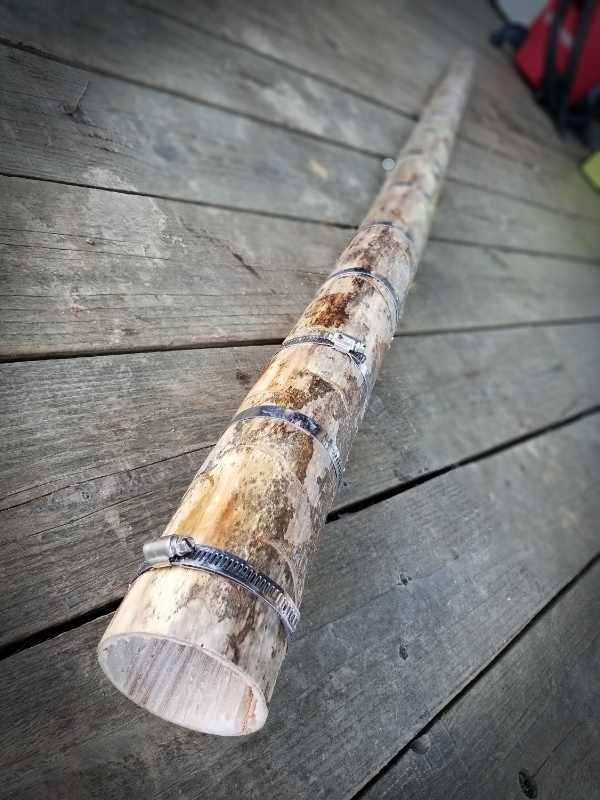 So, I used a Japanese pull saw to tune it by cutting off the length bit by bit until i got a D. What was a six foot didge is now just under five feet tall. The next step is pouring a second coating of epoxy through the inside from the bell end to get a nice even coating throughout the didgeridoo and to fill in any spots that were missed in the first coating. So, I poured the second coating of epoxy through the inside of the didge and I made a boo boo for the first time in eight years. As it was curing, the didgeridoo was laying next to a heater and the epoxy hardened faster than I had planned. I ended up with a buildup that I had to sand out. It wasn’t too bad to work with since it wasn’t completely cured but cured enough to sand nicely. All in all, it took about half an hour to sand it out. Sometimes even the pros don’t get it right but that’s how you learn. After sanding out the boo boo, I put on the first coating of epoxy on the outside. I’ve removed the tape from the holes so it no longer has blue measles and did some final sanding to get a nice surface. 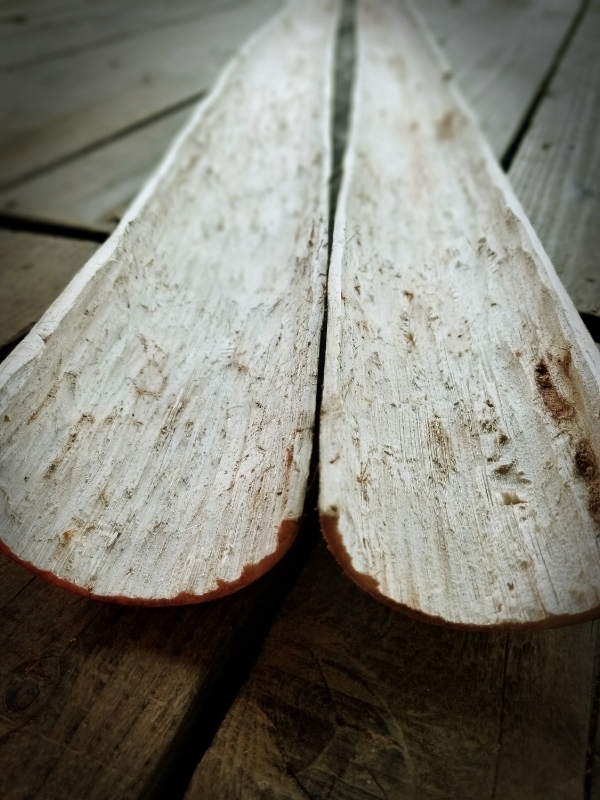 Nature’s paintbrush has blessed this didge with some really sweet spots. It’s going to be a beauty I think….. We’ll know soon! Second coating of epoxy is on. 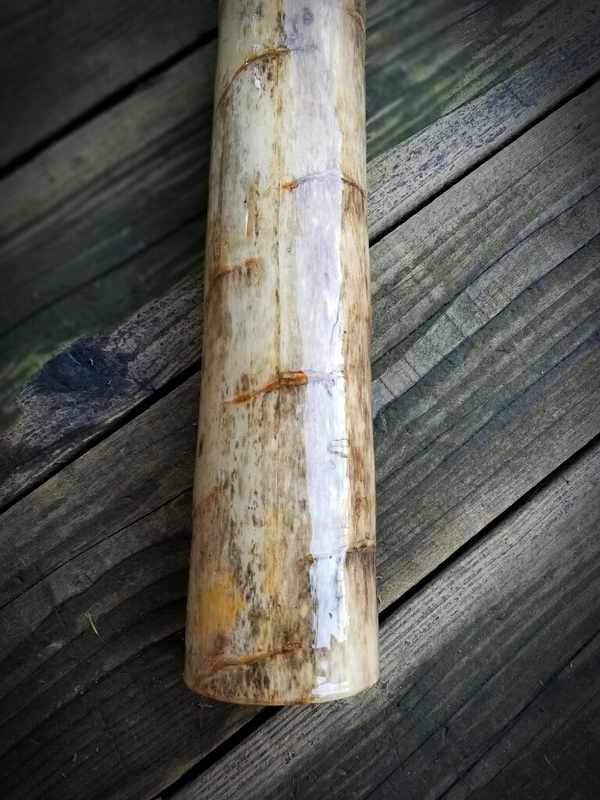 Epoxy not only gave this didge a durable finish but it also helped to strengthen the stalk. When I started this didge, the stalk was super soft to the point that I could squeeze it and more than likely break it just with my hand. I am so happy that I could get a nice resonant didge that is also fairly durable. Next step is to degloss. Wet sanding my way through the afternoon to take the high glossiness off the epoxy so I can give the didge a more satin finish to it. I find this type of finish is much nicer and lets the colors and grain of the wood pop better than the gloss does. So I grabbed some 320 grit wet sanding paper and went to work. 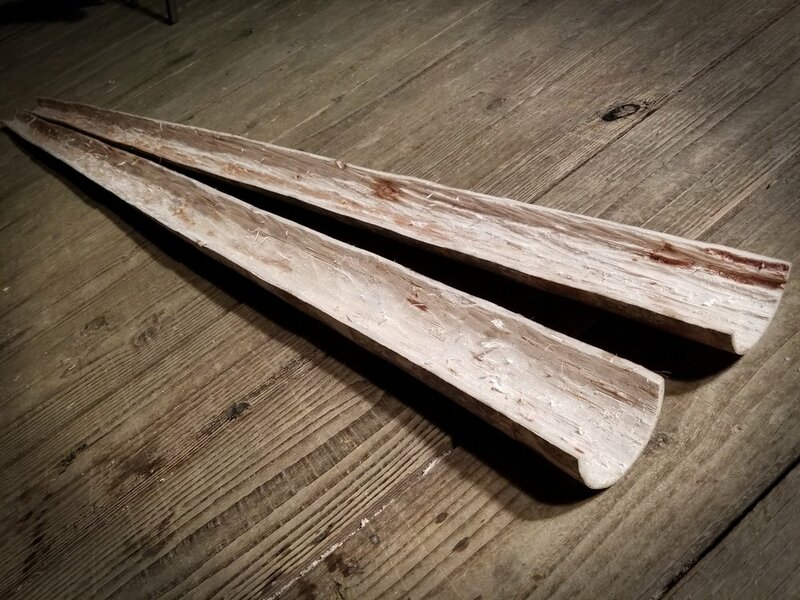 Like many things in the world of didge making, it took at least twice as long to do this bit because of all the little bumps and dips and nooks and crannies that yucca has. So I had to really get down into the last little crevice to make sure I left very few shiny spots behind. After deglossing, I put a coating of wax over the epoxy, let it dry and did a vigorous wipe down to take the extra wax off. I also left the mouthpiece natural and gave it a couple of coatings of food grade butcher block finish, which is a mix of bees wax, carnuba wax and mineral oil. As you can see below, the extra effort is well worth the work. 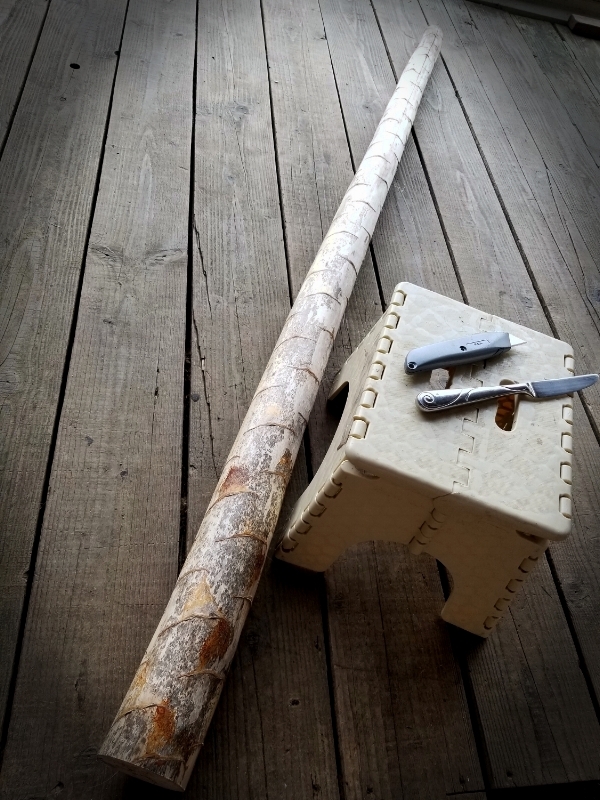 So that’s a wrap: eleven days over six weeks of making this didgeridoo plus the carry bag. It’s now happily on it’s way to its new home in Kansas. I’m sure some of you will read this journal as a step-by-step course of how to make a didgeridoo. This wasn’t my intention. This journal is more meant to be a journey showing the major points of the time, effort and energy it takes to make a didgeridoo. Most of the days I spent with this didge ranged from six to eight hours and many of those hours were spent problem solving, preparing and cleaning up. The rest of the time was what you see in these photos and descriptions. Even though the hours can be long, it’s time well spent creating an instrument that will bring joy to it’s new owners. 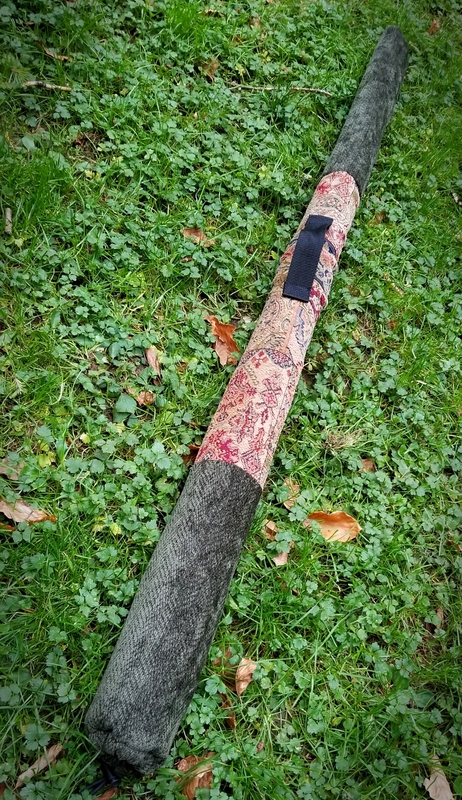 I can’t even begin to describe the feeling I get when I get feedback from a customer about how much they love their new didgeridoo. I become a part of their journey of creation and exploration even though we may never meet. The bond I have with the didge itself is strong. 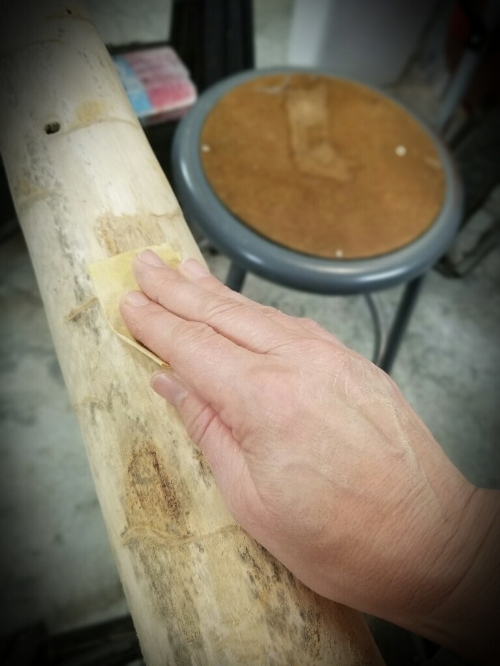 When you work with the wood or stalks, you really get to know every inch of the instrument you’re creating and by the time you’re ready to ship the didgeridoo off, it’s much like sending your child into the world to do its work. That’s when crafting an instrument really becomes something special. I do plan on posting a short video soon with a sound sample of this didge but for now…….it’s tea time. Thank you so much for reading this! I really appreciate the time you spend here and that really means a lot to me. While you’re here, feel free to leave a comment, observation or question. I love it when people engage. Until then, take care. 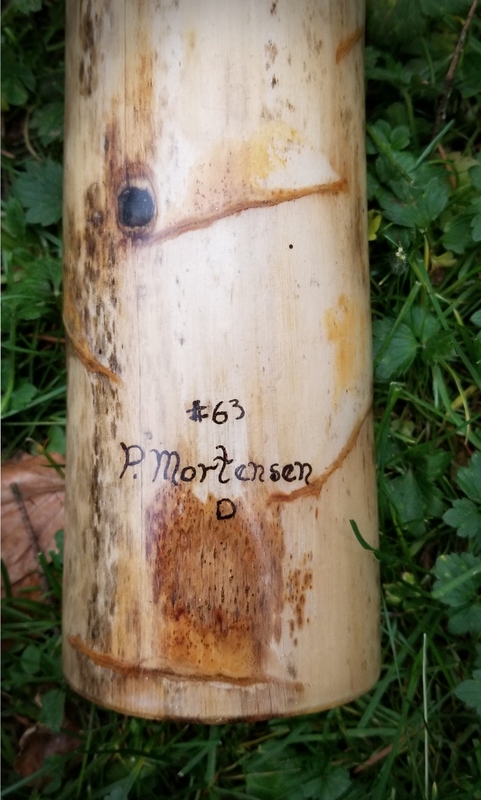 27 Dec 2018 - The didge made it to Kansas and is now in the hands of its happy owner. 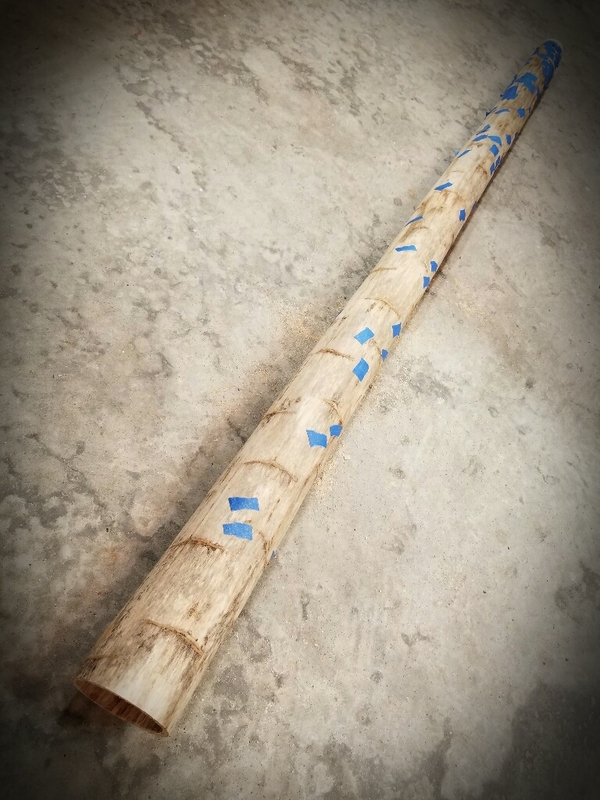 Many thanks Karolyn for the opportunity to make a didgeridoo for you and for your support! May your new instrument bring you as much joy in playing it as I had making it!